I have been seriously neglecting my quilt blocks of late. Am more behind than ever but heyho… I will have a lovely quilt on my bed one day. Just not some day soon! 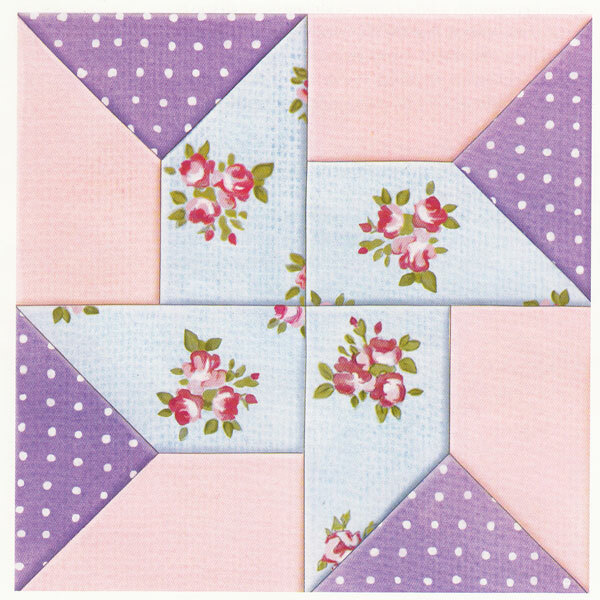 Introducing the Whirligig block, number 20 from issue 22 ‘Art of Quilting’. Though issue 21 supplies the batting and instructions on how to join the first 6 blocks, I feel the need to get a few more blocks underway first. Inset seams are second nature now. Not so daunting any more. Which is lucky because there are a few involved here! The ‘orange blossom’ triangles are first sewn to the gingham pieces. Important to mark the 6mm seam allowance on the triangles before making the first seam. Then you know at what point to stop, where the seams meet. The ‘red daisy’ pieces are then joined to the triangles and then the final seam to the blue gingham completes a quarter of the main block. Once they have been arranged in position, the bottom two quarters are seamed together and then the top two. They can be chained and then snipped apart. Finally the two halves are joined together and the centre seam pressed open with the ‘toe’ of the iron. I have to say this is my least favourite block so far. I think its the fabric colours. They create such a clumsy shape. I did consider selecting different fabrics but I wanted it to be consistent with the rest. The design is meant to be characteristic of the propeller look but it is very interesting how the design changes with use of pretty vintage pastels with more contrasting triangles, which seem to draw the eye more to the centre pinwheel. History: The combination of printed fabric and gingham is very typical of the feedsack quilts of the 1930s. I think, if you made lots the same and joined them together, you would notice the pinwheels more. I hope so, as that is the sort of quilt I have underway at the moment. My pinwheels are plain and the surrounding fabrics bright and, at least in the example of the instructions I’m following, you do get a sense of the pinwheels in the completed quilt. 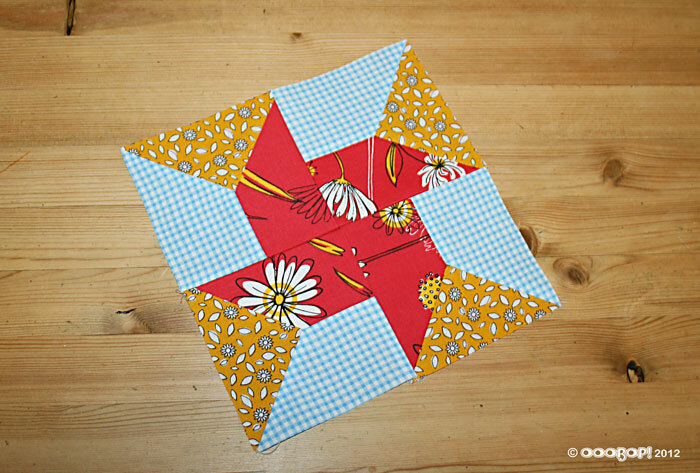 I love that red fabric you’ve used for the pinwheel so much that I can’t help but like your block anyway. Wow, I’m in awe of your quilting prowess! Those seams are beautifully done 🙂 You should be very proud of yourself. I’m not sure how you do a set in seam for quilting, but however you do it, you’ve clearly mastered it. I’ve yet to do a quilt block…perhaps I’ll start with some Christmas decorations as gifts…any suggestions? Ooobop! I’ve decided to make my mom a quilt for Christmas. Thing is, it’s my first quilt and I need to send it overseas to Canada before Christmas. Do you have any suggestions for a good beginner pattern and tutorial (since I know not what I do!) that won’t take me toooooooooooooo long to make? Any help would be much appreciated. Google searches are overwhelming me!